If you work in a city, or away from the home and regularly eat out for lunch, then here's a simple (yet effective) idea to save you a lot of money and possibly eat healthier too. The simple tip, is to make your own lunch. 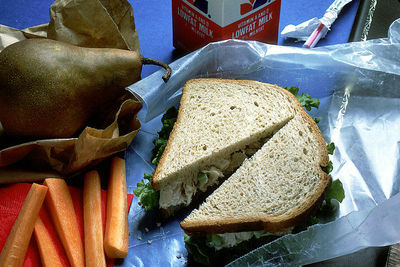 Make a wrap, take a sandwich, eat some leftovers; whatever your preference, just take in your own lunch. If you are eating leftovers from your dinner, you could work out what the cost of your portion is or you could chalk it up as a free lunch as leftovers may have just been wasted. Some packed lunches can be more expensive than others, and some lunches such as pasta or soup can work out very cheap, but as an estimate $2.50 - $4 is a good idea of the cost. If we estimate that a home made lunch costs $3.25 and say that a take away lunch is just over double this cost at $7 then a weekly saving could be $18.75 which would equate to a yearly saving of over $400. If you've been blowing nearer to $10 on your lunch a day, then the saving amounts to over $700 a year. That's a whole lot of money that could be put to much better use. Obviously, eating out is hassle free, and you save time by not having to prepare it yourself. Additionally, there are some yummy options out there so you can be in for a tastier lunch than that you can prepare yourself. That said. taking a home made lunch will save you money, and it can also mean that you know exactly what has gone into your lunch, and make it a healthier option than many take out choices. The advantage of making your own lunch also means that you're not stuck in busy lunch time queues that eat into your lunch hour. If making your own lunch isn't something you have time for, then consider just making a bigger portion of your evening meal so that you can take leftovers in the next day, or consider bulk cooking meals and freezing ahead for easy lunch times. Do you enjoy take out for your lunches, or do you make your own? I very rarely buy food when out and about. If we are going somewhere as a family for the day, I always pack lunch, water and snacks. For my family of 5 eating out can cost up to $50 each time! Even to buy a drink each can cost around $20. I definitely make substantial savings by doing this. Great tip Helen!